Situated along the foothills of the Blue Ridge Mountains, historic Charlottesville, Virginia is the legendary home of Thomas Jefferson, the state’s largest research university, and a bustling food and wine scene. 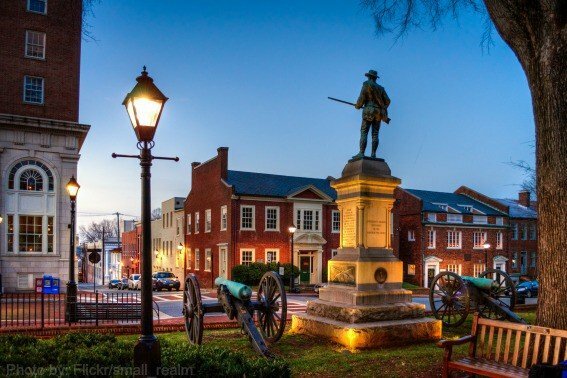 Only 70 miles away from Richmond and 120 miles from Washington D.C., Charlottesville is perfectly located for a mid-Atlantic family to get away for an entertaining and educational visit to one of the country’s most historic cities. Monticello is renowned as the grandest home of the U.S. Presidents, and with good reason. Thomas Jefferson’s exquisitely designed house is absolutely stunning. Set aside at least three hours to take the guided house tour (special family friendly, slavery, and garden tours are available during the high season), walk around the grounds, and visit the exhibit halls and gift shops. Families will love the extensive Griffin Discovery Room, where kids can do everything from lie down on a replica of Jefferson’s bed, build their own architectural creation with blocks, and try some of Jefferson’s inventions. In addition to the Griffin Discovery Room, Trekaroo families also love Monticello’s Family Friendly Tour; it is a perfect fit for families visiting the famous Presidential home with kids ages 5-10, especially those that might have difficulty handling a regular 45 minute tour. 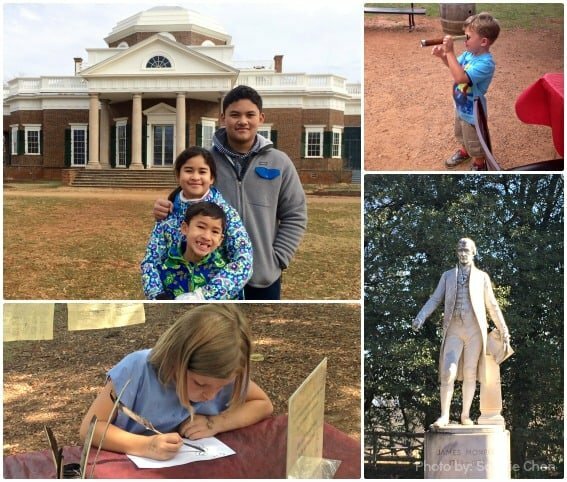 While sticking fairly close to the script of the regular house tour so that parents don’t miss out, Monticello’s family tour guides know how to engage the kids. Children are given a prop to hold during the tour that is highlighted and explained somewhere along the way; small hands, which might otherwise be tempted to touch the house’s historic artifacts, are kept busy with a copy of the Declaration of Independence or baseball-sized nickel. In the spring, summer and fall, when these kid-friendly tours are offered, families can often find hands-on activities outdoors just steps away from the end of the tour. Children can write with a quill and ink just like the founding fathers or try out tools similar to those that Jefferson likely used over 200 years ago at Monticello. After visiting Monticello, stop by the city’s other UNESCO World Heritage Site, the University of Virginia. You don’t have to be a Cavalier to visit the university. Once there, stop by the Rotunda and take a free guided walking tour. Designed by Jefferson, the Rotunda was inspired by the Pantheon in Rome. Even very young kids will be awed by the Dome Room’s majesty. Jefferson’s Monticello may be Charlottesville’s most famous attraction, but there is another President’s home to visit in the area – right down the road: James Monroe’s Ash Lawn-Highland. Humbler than Monticello, Ash Lawn-Highland nonetheless offers an impressive and intimate look at the fifth President’s furnishings, portraits, and personal items, even his set of Presidential china. 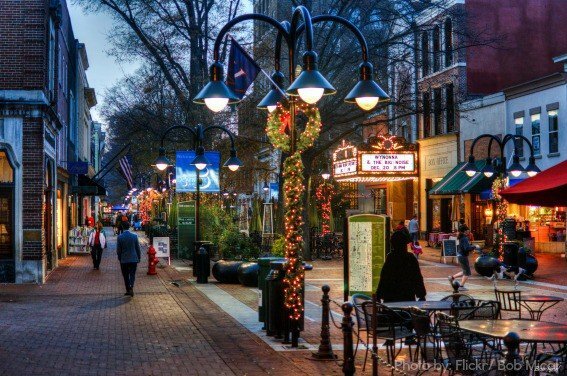 Look no further for a place to dine, shop, and browse, than Charlottesville’s Downtown Mall. A pedestrian-friendly urban space of more than 120 shops and 30 restaurants, the Downtown Mall houses a theater, concert venue, art galleries, and a half-dozen bookstores and toy stores we visit every time we’re in the area. Is there a comic book or graphic novel lover in the family? If so, definitely go to Telegraph Gallery which is expertly stocked by husband-and-wife owners David and Kate. They will help you find a print or book for everyone in the family. Bring your appetite to Charlottesville, because there are plenty of good eats in the city of Thomas Jefferson. The city has 22,000 University of Virginia students to feed, so there is everything from hole-in-the-wall greasy spoons to national chain eateries to high-end farm-to-table restaurants. 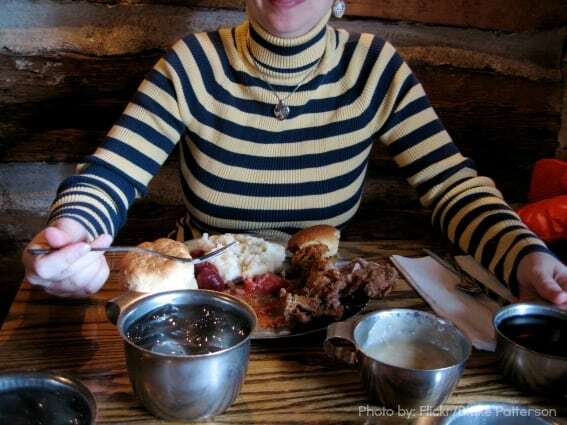 One of our must-eats is the Michie Tavern because The Ordinary has some of the best fried chicken we’ve ever had! It’s all you can eat, so you can have the Midday meal and be full until bedtime. After your delicious colonial-style meal, your family can tour the legendary property. It’s the perfect place to eat after a morning exploring either Monticello or Ash Lawn-Highland. For families who dig the Downtown Mall scene, we recommend the locally sourced Brookville Restaurant, which specializes in pork (even the complimentary popcorn is cooked in bacon oil) and regional ingredients. Citizen Burger Bar also on Main Street is a burger lover’s dream come true, with a menu boasting seven specialty burgers and a dozen ways to make your own. If you’ve traveled by train to Charlottesville, take advantage of the strip of restaurants on either side of the station. Our favorites are the tiny greasy spoon Mel’s Cafe, where you can have Southern cooking of diner staples at an incredibly affordable price, or indulge in Cajun/Creole fare at Fig Bistro, where my husband heartily recommends the shrimp and grits. No trip to Charlottesville is complete for our family without multiple trips for coffee/lattes/hot cocoa/smoothies at Mudhouse Coffee or a breakfast nosh from Bodo’s Bagels. Charlottesville offers a wide variety of options for family accommodations, but we’ve only stayed at hotels. We’ve stayed at the following three and recommend them all, for different reasons. The Omni Charlottesville is in the most central location possible, right on the Downtown Mall. The large hotel’s standard rooms accommodate a family of five, and the amenities include special Omni Kids’ kits with a backpacks full of goodies, cookies & milk turn-down service, etc. The DoubleTree Hotel is a conference facility with full-service amenities, well-appointed rooms, and those signature warm chocolate chip cookies upon arrival that will make kids and parents happy. The new Hyatt Place has spacious rooms with two queen beds, an additional sitting room (we played games on the coffee table every night), and sofa bed, as well as a free full breakfast with eggs, sausage, pancakes, and more. Adjacent to a luxury outdoor mall, the Hyatt Place is close to both Monticello and Downtown. 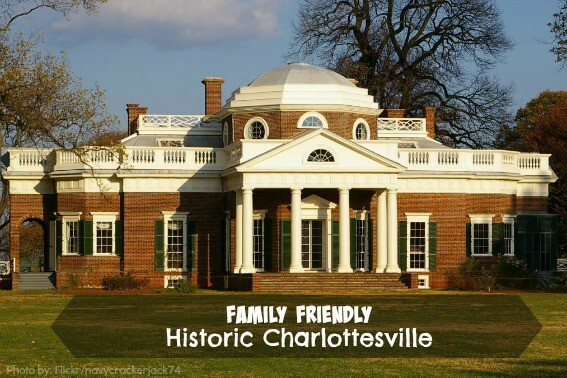 Disclosure: The author and her family were hosted by Visit Charlottesville. While the hospitality was greatly appreciated, at no time was a specific point of view asked to be shared. Sandie Angulo Chen is a professional entertainment and lifestyle writer and has contributed as a movie critic, columnist, or feature writer to Common Sense Media, the Washington Post, Variety, Entertainment Weekly, and the Huffington Post. She runs a Washington D.C.-area blog TheDCMoms.com as well as a young adult book blog, TeenLitRocks.com. You can follow her on Twitter @urbanmama or @teenlitrocks.